Jeremy Camp is a study in contrasts. Known for the hard-driving lyrics of “Speaking Louder Than Before,” “Tonight” and “No Matter What,” his latest project We Cry Out-The Worship Project is a thoughtful and highly reflective collection of songs that express not only where he is as a man but an acknowledgement of the story God has given him. It is the story of a family man whose delight in his children (two daughters, Isabella,7, Arianne, almost 6, and an infant son, Egan) is obvious in his twitpics of ballet recitals, daddy/daughter teas, and his son’s first smile. Interspersed throughout are Bible verses- many words of encouragement – but more than a few seem intended to goad the reader into action. Good News (GN): Do you feel like the release of I Still Believe has widened your connection to your audience, deepened it, or both? Jeremy Camp (JC): Probably both. I feel like writing our story is bringing greater Life . Not in numbers, although that’s happening, but in a deeper connection with people. Next month, Speaking Louder Ministries is going to start doing more overseas outreaches. The first night we were in the Philippines, over 500 people gave their lives to Christ, and the next two nights, 700 came to Christ each night. Next month, we’re going back to Brazil where we had 15,000 people at a concert. It’s not that I care about the numbers, but you think of the lives God is rescuing. We can’t wait to do outreaches in other countries- events that aren’t just concerts, but are able to be constructed as outreaches. GN: Many of the songs people first heard from you like “Walk By Faith” and “I Still Believe” were part of your journey through Melissa’s cancer, your marriage, and her death. In the book, you are honest about there being a time in her hospital room where you were convinced that she was healed. You lay out your confusion, doubts, and even your first steps towards love with Adie. Fans of your earlier projects felt like they already knew you from your lyrics. What does the book add to that conversation? JC: Even my friends will say, “I read the book and although I knew a lot of the story- this is a whole new level.” The book has only been out for a short time but God has used it to open some doors. GN: With so much attention on Melissa, your first wife, a lot of people have commented on the grace Adie has shown. I know that she has had a program titled “Ask Adie” on GMC. How is she insuring she’s not viewed as a postscript to your and Melissa’s story? JC: She’s incredible. With Egan and the girls, she’s not looking for things to be busy – she just taught a Ladies Study at our church and she did an amazing job. GN: You’ve taken new BEC recording artist Adam Cappa on your most recent trip to the Philippines and he’s touring with you and Francesca Battistelli as part of the We Cry Out tour. When you are in Florida, a local artist, Johnny Jones, will be opening for you. Tricia from the group Superchick said she was at a barbeque in your backyard that you hosted so artists could have a safe place to hang out and download about the industry. Karen Kingsbury has over 15 million books in print and she is such a fan that she wrote the foreword for the book where she talks about relying on your lyrics during a difficult time in her life. You’re only 34, how did you become an elder statesman/mentor in the industry? Was it growing up the son of a pastor or is as simple as it’s a natural part of your personality? JC: I think it’s just how God wired me. I’ve been through a lot already at a really young age. It’s not like I’ve gotten to the point where I’m thinking- look at me, let me show you how smart I am. I have the feeling that I’m going to look back in ten years and say, “Wow, I was an idiot.” It’s just my heart- it’s what God has laid on my heart as a way to help others and I have to follow that. Whatever wisdom I have, I have to pass it on…whether it’s what I’ve learned about God or about touring or the music industry. It’s not that Jeremy became an author because the music thing wasn’t working out; his record sales topped three million, he’s charted 20 number one songs, received plenty of Dove awards, Grammy nominations and a nod as ASCAP songwriter of the year. Jeremy welcomes the roles of husband, father, artist, and even evangelist. GN: It’s obvious from your lyrics, your tweets, your video blog, your concerts and even the chance to spend a few minutes with you backstage that your hunger is for people to know Christ. Each night of the tour, it seems that many in the audience respond to the gospel and pray with you to surrender their lives. With the demands of your expanding family, a new vision for your Life and a demanding tour, how do you stay balanced and keep the main thing, the main thing? JC: Some people have looked at all we’re doing and wondered if I have too many irons in the fire. All I can say is not at all. Every opportunity to share the gospel with the book, the music, and even the outreaches is something that we have been seeking from God and something that He has placed in our lives. I’m also not doing any of it alone. I’ve got great people working on every project with me. Because it is from God, I can compartmentalize it all and handle each project individually. The chance to experience a concert and spend some time backstage with Jeremy during his We Cry Out tour with Francesca Battistelli and Adam Cappa leaves you with a few strong impressions. The first is amazement at all those Bible verses he speaks about – from talking about God and about His Word in the hall, from the stage and at the “meet and greet” – seems as natural to Jeremy Camp as breathing. The second is that despite all the professional accolades and the drama associated with his first marriage, he could be the guy in the cubicle next to you at work or the one you meet after work for a pick-up game of basketball. His quick laugh and infectious wit has you as comfortable with him as with any of your other friends. 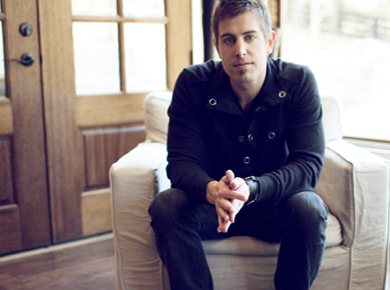 The We Cry Out tour featuring Jeremy Camp, Francesca Battistelli, Adam Cappa and local artist Johnny Jones is coming to the Sunset Cove Amphitheater in Boca Raton on March 23, 2012. Tickets are available through ReachFM.org or by calling iTickets at 1-800-965-9324.